The M24 Orion is a fully enclosed, side by side two seat, dual control model specially designed for those who do not want to go without comfort, even when having fun. The cabin layout reflects the company policy and its precise choices; the use of valuable materials and elegant chromatic combinations are just examples of the meticulous care in developing each feature. The black instrument panel gives a dynamic contrast of colour. It increases the perception of the inner space and grants a perfect backdrop to the fitted equipment and instruments which are easily readable. In addition to the usual flight instruments, it is equipped with the latest version of the Rotax Flydat, a unique digital instrument displaying 9 engine parameters simultaneously. A large number of useful emergency/control warning lights are connected to the instrument system providing information on the rotor brake, exhaust trim, low fuel level and battery charge. The M24 Orion is equipped with two baggage compartments. The first one is placed inside the cockpit, “hidden” under the right seat cushion, the second, placed outside to the left of the gyroplane, allows also the optical fuel level check. The M24 Orion is powered by ROTAX 914 Turbo, 115HP. The 82 liters fuel tank capacity assures up to 4 hours of flight at a cruise speed between 120 and 150 km/h. 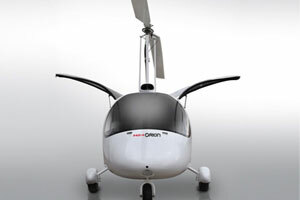 The M24 Orion is the ideal gyro to enjoy all condition flying, even on cold winter days. Manufactured in epoxy resin reinforced with fiberglass and carbon fiber.